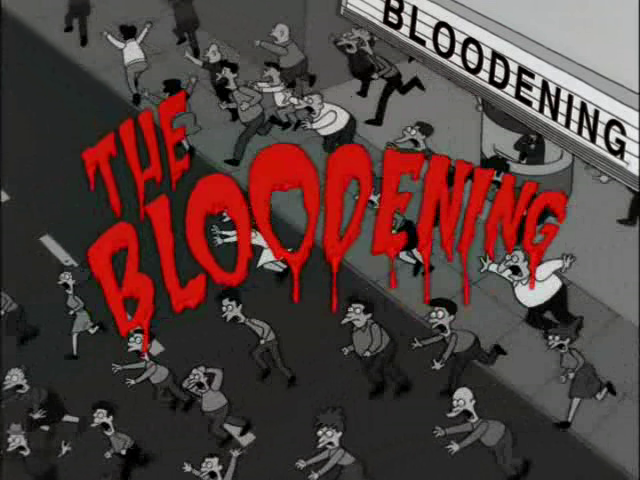 The Bloodening is a British black-and-white horror movie that was shown at the Springfield Drive-In. One of the psychic children. The movie features four mysterious blonde-haired children with English accents and strange powers, including mind control, telepathy and telekinesis. 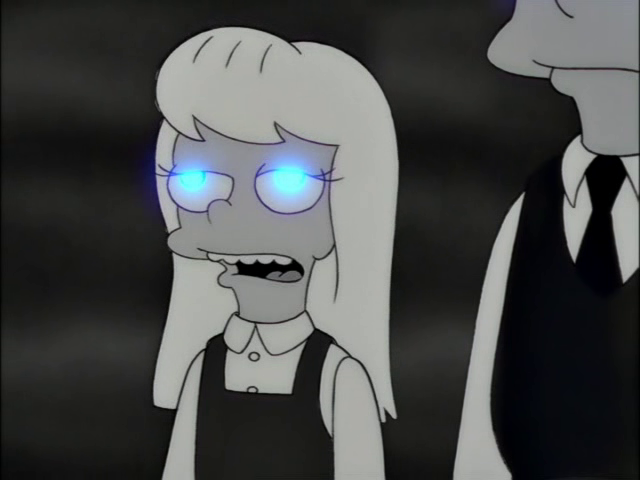 When their powers activate, their eyes glow with a piercing blue color. When the children first confront the townspeople, they reveal secrets such as the minister has been pilfering from the poor box, and the doctor and the bootblack are jointly having an affair with the fishwife. The townspeople then brandish weapons such as knives and pitchforks and start to attack the children. One of the boys says, "We can't have that," and the children's eyes begin to glow, causing the townspeople to start attacking each other with their own weapons. The kids of Springfield, after a town-wide curfew was enacted, snuck into the Drive-In to see this movie, which inspired them to get revenge on their parents by broadcasting their secrets over the radio. The Bloodening is a parody of the 1960 horror classic Village of the Damned, which was based on the book The Midwich Cuckoos. The film's trailer parodies a trailer of the New Zealand film Braindead (released as Dead Alive in North America). Modified on January 27, 2017, at 17:15.